For any skill in child development to be supported, it needs to be supported from the bottom up. All skills need a good foundation and handwriting is no exception. Like most skills, all is not what it seems, and a lot more is involved than you may think. The eyes need to work with the hands to coordinate movements with the arms. The arms obviously connect with the shoulders to coordinate movements with the trunk. Not only is nearly the whole upper body involved in a physical/motor sense, but these movements are also impacted by visual and sensory skills that fine-tune each of the motor movements. In order to give a child the best possible chance to improve their handwriting, we need to ensure that each of these components are being supported. ⦁ Chair Size: the child’s feet need to be flat on the floor, resting easily at a 90 degree angle to their ankles. This then puts the knees in a nice 90 degree angle, supporting good posture. 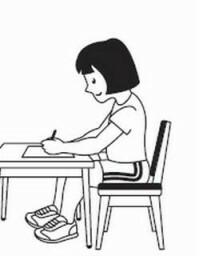 ⦁ Hip angle: hips should also be at a comfortable 90 degree angle, with the child being able to sit back into the chair. ⦁ Tops of the legs: should not touch the bottom of the desk. 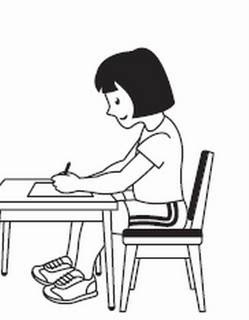 ⦁ Adjust the desk, not the chair: once the chair is right, it is usually easier to adjust the desk around this, rather than change the chair again. ⦁ Use a small book or stool under their feet if feet do not touch the ground. ⦁ If the chair is too low, put a book or cushion under the child’s bottom to raise him up. ⦁ Books under the legs of the desk can raise it up.